Welcome to the Website of Claire and Antoinette Cann, duo-pianists. Here you can read about us, contact us, listen to samples of our recordings, download free MP3 tracks and purchase our compact discs from our E.Store. "An unforgettable recording by the Cann sisters, a scintillating spontaneous collection of music for piano duet including the finest Debussy Petite Suite in the catalogue." "effortless virtuosity... magically refined tone... the Cann Twins played together on two pianos with fascinating perfection." "Perfectly coordinated performance... the audience listened enthralled." 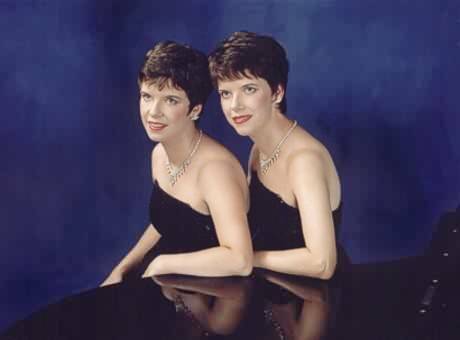 "The internationally renowned twins gave a spellbinding recital ...breathtaking brilliance, fluency and precision confirmed this recital to be world class." Enjoy 3 complete classical tracks performed on two pianos... our thank you for visiting our Web site! Simply sign up below, download and listen to them at your leisure. We respect your privacy and will never trade, sell or share your details. All our CDs are available by post... delivered to your door!